If you’re thinking July = holidays… think again! This month’s pick of the top snaps is all about productivity. Graphic design tools, web code editor, Go IDE, JSON configuration, blockchain wallet and Openstack… Ready for an active summer? If the term “snaps” doesn’t ring a bell, they are a new way for developers to package their apps, bringing many advantages over traditional package formats such as .deb, .rpm, and others. They are secure, isolated and allow apps to be rolled back should an issue occur. They also aim to work on any distribution or platform, from IoT devices to servers, desktops and mobile devices. 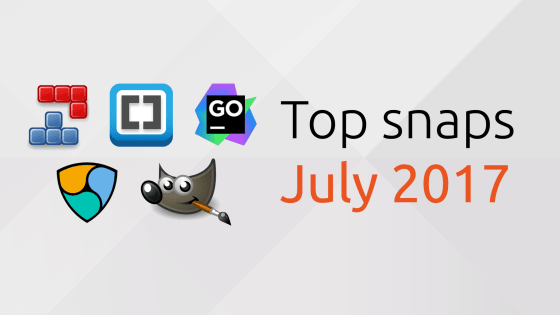 Snaps really are the future of Linux application packaging and we’re excited to showcase some great examples of these each month. GIMP is … is there really a need to introduce GIMP? THE free, open source cross-platform image editor, for anything from advanced graphics design to quick image fixes! Install GIMP from the Software Center. Install Brackets from the Software Center. Install Radiomanager-cli from the Software Center. Quadrapassel is a derivative of a classic Russian falling-block game. Reposition and rotate the blocks as they fall, and attempt to fit them together. When you form a complete horizontal row of blocks, the row will disappear and you score points. The game is over when the blocks get stacked too high. As your score gets higher, you level up and the blocks fall faster. Install Quadrapassel from the Software Center. Diff browser for MediaWiki based websites intended to deal with vandalism. Install Huggle from the Software Center. This tool allows you to perform a bus reset on a USB device connected to your system. If the device has got confused, this may sort it out. Install Usb-reset from the Software Center. Install Nanowallet from the Software Center. Install Gogland from the Software Center. Jsonnet is a domain specific configuration language that helps you define JSON data. Jsonnet lets you compute fragments of JSON within the structure, bringing the same benefit to structured data that templating languages bring to plain text. Install Jsonnet from the Software Center. Keystone provides authentication, authorization and service discovery mechanisms via HTTP primarily for use by projects in the OpenStack family. It is most commonly deployed as an HTTP interface to existing identity systems, such as LDAP. You can find out more about Openstack as snaps.